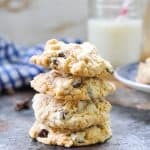 These classic old-fashioned Oatmeal Chocolate Chip Cookies are a family recipe that has been passed down for generations. Made with just a few pantry staples, you can whip up a batch of the easy, homemade treats whenever a craving strikes -- and then share them with your loved ones! In a large bowl, use an electric mixer to cream together butter and powdered sugar. Add vanilla and oats. Gradually mix in flour and baking soda. Drop by tablespoonfuls onto greased cookie sheets. Wrapped tightly, these cookies freeze very well after they are baked! Serving a larger crowd? My great grandmother usually doubled the recipe!